The nation’s No. 2 military officer reiterated calls to curb service members’ pay and benefits during a speech Wednesday at the Air Force Association Air and Space Conference in National Harbor, Md. 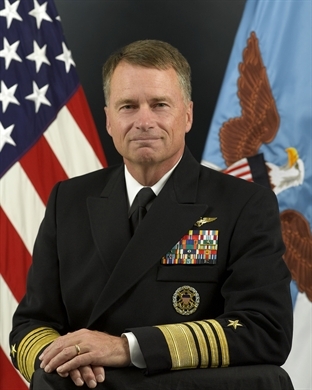 Growth in pay and benefits is “out of touch and simply not sustainable,” said Vice Chairman of the Joint Chiefs of Staff Adm. James Winnefeld. “While everyone here would agree that our magnificent men and women in uniform deserve more than the average bear, we simply cannot sustain our recent growth trajectory in pay and benefits and expect to preserve a properly sized, trained and equipped force,” Winnefeld said. As the military faces an ongoing financial crisis with no end in sight, Congress should also allow the services to get rid of older equipment and close excess bases, he said. “The only future that seems certain is that there are no Doolittle raiders coming over the horizon, ready to strike courageously at the heart of our fiscal troubles,” Winnefeld said. Yeah, let’s start with your pay and benefits, Admiral Winnefeld. How about putting your money where your foot is (in your big privileged mouth) and live off the D.C. area economy for 3-years with the pay and benefits of an E-5 or below sans all of your general officer perks and the luxuries you and your family have come accustomed to. While you’re at it, deploy for a year to Afghanistan driving trucks in a convoy for the Army while your family tries to make due without you, your wealth, or your privileges. In know way am I saying you haven’t earned what you have or disrespecting your service, but you, SIR, are out of touch! How does the sickening cost of new equipment, ie aircraft, which can support whole countries, escape the eyes of the money handlers? Oh yes that’s right, the aircraft are sold to borderline or dangerous countries as bribes or for black ops expenses. People are unimportant and you can’t sell them…..yet. b) Outsource all ship building requirements to South Korea. Trying to balance the budget on the backs of the backbone of the service. How is an E-5 with a family supposed to make ends meet while being deployed and being away from their family if their pay is cut. You’ve got politicians that I don’t think have to put in 20 years in order to get a pension like we do and you want to cut our benefits. Why is the first answer always to take it from the little guy one way or the other either in the form of taking away benefits or making us pay more taxes while the national debt increases. I hope somebody wakes up soon before it’s too late. Is anybody in Washington listening????? It is encouraging to see the top brass address this issue; it’s long overdue. Failure to do so poses a huge threat to America’s ability to buy the weapons systems it needs in the numbers needed to be prepared for multiple threats in the world. Rising health care costs have become their own national security threat simply because they have been rising at ever faster and unpredictable rates. The comments reveal how easy it is to become disconnected from the reality of the world living within the cocoon of the military. Since I separated in 1990, military pay has outpaced growth in federal civilian pay by about 2-1 (GS-14/O-5 level) while the real value of average American’s pay is less than what they earned in 1989. Come January, federal civilians will see a 1% raise, their first in four years, meaning they’ve lost about 10% of their earnings over that time. Grouse all you want about housing allowances but most people pay their rent/mortgage out of their check. They are totally unaware that an O-5 in DC gets a housing allowance larger than the average American income. The worst thing you can do is to start thinking you’re especially deserving of your pay and benefits; that’s totally contrary to the whole idea of service. And in defense of general officers, just how much do you think they’re worth? Do you know what they earn when they retire and go to work as civilians? Trust me; a general/admiral is a real bargain. Want a real reality check? Next time you’re out with your civilian friends, suggest teacher should be allowed to retire at half pay and full medical after 20 years of work. I think you’ll gain a new perspective rather quickly. Jay Edmiston, you appear to be an intelligent, in the know, person so I wonder if you would answer a question. Just how much does the process of General officers doing favors for civilian companies or their board members affect their post military life. I’d say less then five per cent don’t abuse their position or prostitute themselfs. yea, reduce pay and benefits, says an admiral. Reduce the amount of staff officers and you save money quick. We don’t need the inflated number of admirals and generals that we currently have. The enlisted force, warrant officer corps, and field grade officers can take on more responsibility to fill the gaps, and there would be no hiccups. Have no problem with holding retirement benefits until age 62-65. But salary and housing are necessary to take care of families that must be highly mobile making it dififcult for a 2 earner family to be established. But in our American economy, it takes both husband and wife working decent jobs to pay the bills. As far as the perception that housing is some kind of luxurious endowment, I would suggest that retired folks who haven’t been in in a awhile don’t have a clue about how much current uniformed personnel give up to support their life of service. How about we start cutting excess contractors and civilian since it is a “uniformed service”. Jay Edmiston, how much do you think an E2 through E6 is worth? They are the ones that have the majority of boots on the ground and they are the ones that have suffered most during the conflicts that the US has engaged in the past 30+ years. I am also a Federal Civilian and I don’t begrudge the military any benefits they can receive. When you talk about how military pay has out paced civilian pay at the GS-14/ O-5 level I have to smile because the majority of career military will never reach either levels. You want a reality check, crunch the dollar numbers for a lower ranking enlisted groundpounders vs his/her civilian counterpart. Put the picture in perspective please. Look at all the expensive cars on the Air Force bases and try to justify given those cry babies a raise….they just blow their paychecks at the bx buying video games anyways. Really? I guess the fact that many of our lower ranking troops with families live at just above the Federal poverty level and many qualify for SNAP, WIC and other nutrition programs doesn’t enter into this discussion. The fact that these are the people who bear the brunt of the decisions made at the higher levels doesn’t enter into the discussion either I guess. Those that sit in the Pentagon and make 10 times more than the people whose lives they effect makes me sick and maybe instead of cutting the pay of the enlisted, we should get rid of a few generals and admirals. As for holding retirement pay until a person is 62-65; okay, so you have someone separate and tell them, okay, now you have to wait to collect anything for the 20 years you just gave us – and oh, by the way, go find a job in this economy. Are you kidding? In some areas of the country, you can’t find work for months and if you do, because of the Affordable Care Act (aka Obamacare) you probably won’t get a full-time position – most places are just not hiring full time workers right now. I like that idea – serve your country for 20 years (or more) deploy when you’re told, PCS when you’re told, leave your family behind for that remote everyone does and hey, after 20 years (or more) you can get out and wait for 20 or so years to collect your retirement – if the government hasn’t bankrupted the military retirement system like it has Social Security. Yes, I can see that will do a lot for recruitment and retention. @Jay, clearly you are out of touch with reality. Military service is for the young–and only 13% meet standards for entry. Teachers don’t deploy or even work year round. No slight on them because I know I couldn’t do that job well, but no comparison whatsoever. This brass is looking out for themselves, because when it comes right down to it, they like to cut others but not themselves. Pandering to the powers that put them there. Look at the 10% growth in number of general/flag officers since 2001. Force size is about the same and we have far less bases, aircraft and ships, but more GOs? And with each GO comes an inflated staff. Looking for cuts, look at the Pentagon. Good luck buying quality folks to fight “on the cheap”. It’s “up or out” so only the best of the best get that retirement for 20+ years of unselfish service and sacrifice. Another out of touch flag officer who espouses the latest trend in corporate America. How about start with closing the numerous unneeded overseas bases or cutting the govt welfare payments to the military industrial complex that continually delivers underperforming and overbudget weapon systems. This guy is shortsighted and obtuse in his failing to understand that our military has operated under conscription since the early 80s. Platitudes and patriotic narratives aside, a quality individual must feel properly compensated. The only way you can get away with low pay and poor QOL is with a draft. We all know that isn’t politically palatable. There are big issues it seems with the Air Force suppressing Christian beliefs. No longer is it easy to direct someone to the Latrine. You now have a Lesbian Latrine, a Homosexual Latrine, Transgender Latrine as well as the not so politically correct Men and Womens Latrine. There are Gay Commanders, First Sergeants, Supervisors, Co-Workers etc… They are infiltrating the Military and soon will have LGBQT Commanders Call. There will be in the not so distant future Officers Wives Clubs, NCO Wives Clubs and Gay Clubs. It is already getting more difficult for a person having Christian Beliefs to survive in the Military. Sadly, the Air Force today is rapidly progressing toward a service we do not recognize and can no longer be proud of. Sorry, this was posted here in error.